Mykonos is renowned for its beautiful beaches and all-night parties, but few visitors take the time to discover the island’s cultural heritage. This private tour visits the Agricultural Museum and the Nautical Museum, then cap it all off with a tasting of the island’s finest Greek wines. Meet your private guide in Fabrika Square in Mykonos Town and then set off on a walking tour of the old town. Explore the narrow alleyways along the waterfront as your guide tells stories of the pirates that once roamed the island’s streets. The first stop of the evening is the Agricultural Museum, where the highlight is the historic Bonis windmill, followed by the Nautical Museum, with its remarkably preserved lighthouse and impressive collection of model ships. 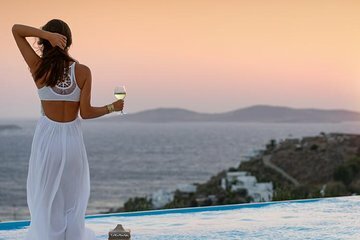 After delving into island life, finish off your tour with an expert-led wine tasting and learn more about Greek wine as you sample some of the island’s finest varieties, accompanied by tasty mezes. Your tour ends back at the starting point.